Dashboard > Help Center > For Manufacturers: How are products scored? Portico's scoring protocol, originally developed by Google's Real Estate and Workplace Services team in collaboration with standard makers and industry experts, follows a product optimization framework progressing from inventory to screening to assessment to optimization as described below. Inventory - Product contents are identified, disclosed, and characterized, along with certain material and product level information. Screening - Product contents are cross-referenced against authoritative chemical hazard lists to identify any human and environmental health hazards known to be associated with the individual contents. Screening may also include Restricted Substance Lists (RSLs). Assessment - Product contents are evaluated through a toxicological review of science literature, modeling and analogues to identify the hazard profile across a full set of environmental and human health endpoints, such as cancer and neurotoxicity. Exposure may also be evaluated if necessary to prioritize high hazard substances for avoidance. Optimization - Product contents are reformulated to use only chemicals which have been assessed as low in hazard. The ultimate goal is to systematically eliminate chemical hazards in products, prioritizing actions that reduce human exposure throughout the lifecycle, not just in the phase of occupancy of a project. Public disclosure of product contents and their associated health hazards is critical to solving our material health challenges. In a marketplace with relatively few optimized products, transparency provides value for both buyers and manufacturers, and it serves as an engine for innovation. Through public disclosure, manufacturers show hard-earned progress along the path towards optimization and demonstrate that they know and stand behind their products. Transparency enables buyers to make more informed choices and show preference to manufacturers that are actively working along the path towards optimization for health. Transparency also reveals where better solutions are not yet available. Uncovering challenges that impede a transition to healthier materials is critical to identifying opportunities for innovation, and transparency is key to rewarding leading manufacturers who invest in solving these challenges in partnership with owners and buyers. Associated Hazard (0-8 points) - Points are awarded based on a minimum of full hazard screening, with the ideal of having all product contents fully assessed and optimized. Screening and assessment is currently determined based on either the GreenScreen for Safer Chemicals or the Cradle2Cradle (C2C) certification program. Transparency (0-4 points) - Points are awarded based on whether the full content inventory is available to the public and/or verified by a third party. Total scores of 0-3 points are considered "Below Criteria," scores of 4-10 points are considered "Meets Criteria," and scores of 11-16 points are considered "Exceeds Criteria." While these statuses are general guidelines, a design project may require more or less depending on the specific needs of the project, so it is always best to communicate with the project representative. Health Product Declaration - By default, a complete Portico record follows the HPD format, making this the most common pathway for products to score in Portico. A fully screened content inventory disclosed to a minimum of 1,000ppm is required to earn points through this pathway (see details below). Full GreenScreen assessment - A product that has all contents fully assessed according to the GreenScreen for Safer Chemicals can earn additional points for this full assessment. 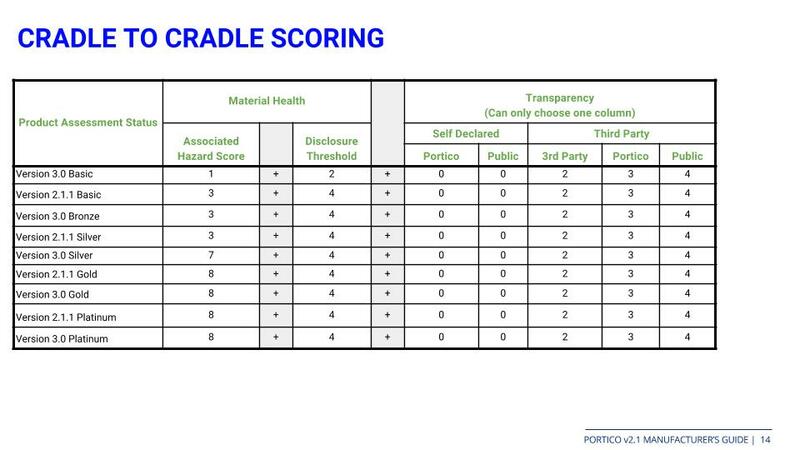 Cradle2Cradle certification - If a product has a full Cradle2Cradle certification, the Material Health score of the C2C scorecard is used for Portico scoring. C2C Material Health Certificates are also accepted and scored according to the same levels. While this pathway does not currently require a full content inventory to be entered in Portico in order to meet criteria, we still recommend completing this portion as it is required by some partners and projects. Certifications and Compliance (required for Cradle2Cradle pathway only) - Cradle2Cradle certification is one pathway for indicating the level of inventory, screening, assessment, and optimization of a product. All material weight percentages add up to 100%. As a basic check for full content reporting, we take the sum of the percentages (or the maximum percentages, if a range is reported) to make sure there is not a percentage of the product not reported. If the product uses a Nested Materials Inventory method, all substance percentages in each material must also add up to 100%. All substances are characterized and screened. Portico connects to the Pharos Chemical and Material Library for automated hazard reporting of substances. All substances must be identified by their CAS registration number (if available) or by their name (if it is a biobased substance). Some unregistered materials are also included in the Chemical and Material Library. If a manufacturer cannot disclose the identity of certain substances, partial scoring may be possible if the substances are undisclosed, as long as they are screened for hazards, or if undisclosed content makes up less than 10% of the product. Substance notes are provided for specific cases. The HPD Standard requires substance notes for certain cases, such as when a percent range is greater than 20%, or when recycled content is indicated. A warning message will be shown in the form for such cases. 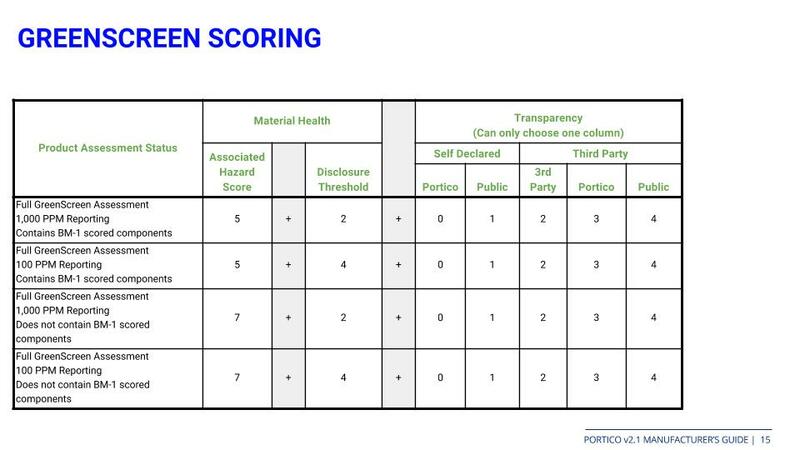 GreenScreen scores of substances, based on hazards and public full assessments imported from the Pharos Chemical and Material Library, are used to determine the associated hazard score. Products screened not to include BM-1, LT-1, or LT-P1 substances will score more highly than those that include these substances, and products with all substances fully assessed will score more highly than those that are not (see full scoring charts above). Verification and Public URL (optional for GreenScreen) - In addition to the content inventory, this section is another possible place to upload documentation of full GreenScreen assessment for all substances, if available. Is the information presented in the product record (especially the full content inventory) made public? Is the information presented in the product record (especially the full content inventory) verified by a third party? For Cradle2Cradle scoring, third party verification is inherent in the Cradle2Cradle certification information provided in the Certifications and Compliance section of the product profile. Other determinations of published data and third party verification are captured in the Verification and Public URL section. Are all required data sections showing as "Complete"? Roll your cursor over any "Incomplete" markers and check especially for any warnings in red, as these indicate required items. Are all materials disclosed to a minimum of 1,000 ppm? Does the content inventory include uncharacterized and unscreened substances? If these add up to greater than 10% of the product submission, the product will not be scored. Any undisclosed or unscreened content will limit the number of points a product can receive. Did you submit the final data record? If you are seeing a discrepancy between the "current score" on the righthand side of the profile and the summary score at the top, it is likely that the data needs to be resubmitted for changes to take effect in the score. 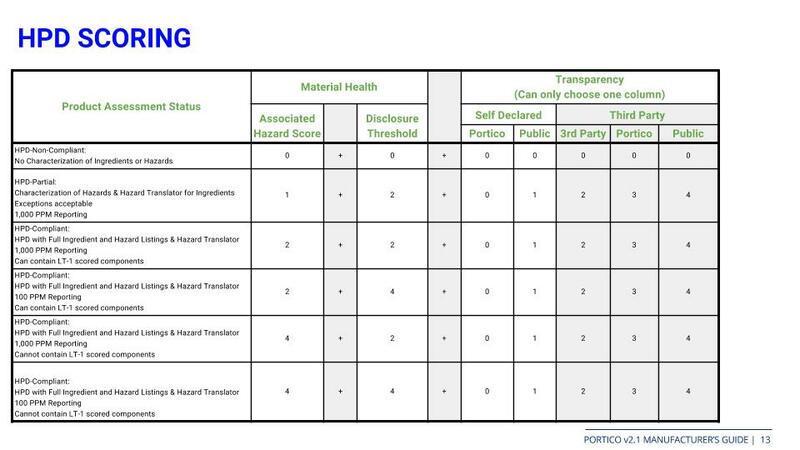 Many Portico projects use the "Meets Criteria" product status as a baseline for determining what products meet the health and transparency needs of their project. However, a project may still use a product that is Below Criteria by requesting an exception. For example, if there is no available product that meets criteria for a given application, a project may select from the best available based on the data provided. It is always preferable to complete a Portico product record, even if it doesn't achieve a high score, than to not respond to an information request.